Die Kanonissen des Frauenstifts Gandersheim verfügten im Mittelalter über eine große Zahl von Reliquien. Die so verehrten Heiligen wurden als wundertätige Helfer und Beschützer des Besitzes angerufen, die das Seelenheil des Konvents wie seiner Wohltäter sichern sollten. Der kostbare Reliquienschatz spiegelt das soziale Ansehen, den politischen Einfluss und die internationalen Beziehungen des Stifts wider. Erstmals wird hier die mittelalterliche Heiligenverehrung in Gandersheim systematisch dargestellt, gestützt auf eine besondere Quellengrundlage: die außergewöhnliche materielle Überlieferung des Frauenstifts. 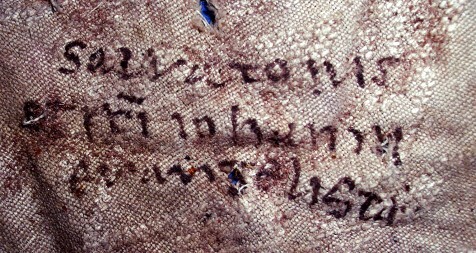 Insbesondere die überlieferten Reliquienpäckchen mit ihren textilen Umhüllungen und Authentiken wurden sorgfältig analysiert. Die Auswertung der Schriftquellen konzentriert sich auf die liturgischen Handschriften. 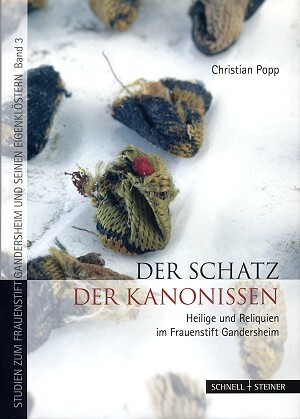 Präsentiert wird eine Edition des spätmittelalterlichen Liber Ordinarius - ein Desiderat der bisherigen Forschung zum Frauenstift Gandersheim. Diese Quellenbasis ermöglicht eine weitgehende Rekonstruktion des Gandersheimer Heiligenhimmels, verbunden mit Thesen zur Funktion und Herkunft einzelner Heiliger sowie zum politischen, sozialen und religiösen Beziehungsnetz des Kanonissenstifts im Früh- und Hochmittelalter. 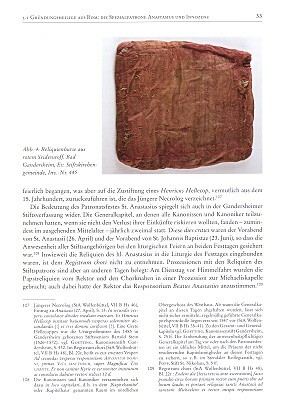 Pionierstudie zu einem Kirchenschatz, in dem nicht kostbare Reliquiengefäße, sondern die Heiltümer selbst und die frühmittelalterlichen Textilien im Fokus stehen. Gandersheim Abbey was a proprietary foundation by Duke Liudolf of Saxony and his wife Oda, who during a pilgrimage to Rome in 846 obtained the permission of Pope Sergius II for the new establishment and also the relics of the sainted former popes Anastasius and Innocent, who are still the patron saints of the abbey church. The community settled first at Brunshausen. The first abbess was Hathumod, a daughter of Liudolf, as were the two succeeding abbesses. In 856 construction began on the church at Gandersheim and in 881 Bishop Wigbert dedicated it to the Saints Anastasius, Innocent and John the Baptist, after which the community moved in. Already in 877 King Louis the Younger placed the abbey under the protection of the Empire, which gave it extensive independence. 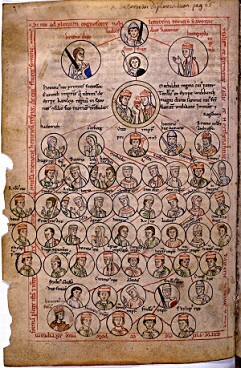 The close connection to the Empire meant that the abbey was obliged to provide accommodation to the German kings on their travels, and numerous royal visits are recorded. The establishment of the abbey by the founder of the Liudolfingers gave it especial importance during the Ottonian period. Until the foundation of Quedlinburg Abbey in 936, Gandersheim was among the most important Ottonian family institutions, and its church was one of the Ottonian burial places. The canonesses, commonly known as Stiftsdamen, were allowed private property and as they had taken no vows, were free at any time to leave the abbey. The Ottonian and Salian kings and their entourages often stayed in Gandersheim, and the canonesses were by no means remote from the world. Apart from the memorial masses for the founding family, one of the main duties of the canonesses was the education of the daughters of the nobility (who were not obliged to become canonesses themselves). The abbey is now used by the Evangelical-Lutheran parochial group of St. Anastasius and St. Innocent. During restoration works in 1997 there came to light some of the old church treasure: relics, textiles and reliquaries. These have been on display since March 2006. Registrum chori ecclelsie maioris Gandersemensis, it is published in the appendix of the book, as well as a list of documents which are published or not published. - from the 12th c. onward there is a well preserved and up to date list of treasures. - in the library, in 1956, a list of relics came to light in the cover of a book of the 16th c.
- in 1973 documents of the convent were published. 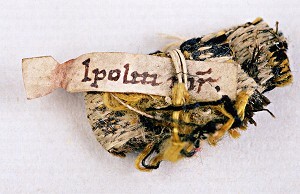 In the center of the book in question and of the research there is a collection of more than 200 small packages with relics of Saints, which are carefully wrapped in precious textiles. The Saints were worshipped in Gandersheim as helper, as protector of possession, as guarantee for salvation. The analyses of the textiles show that almost 100 of them were made from identical fabrics, which had been woven between the early 9th c. and the late 10th c. About 70 of the packages are provided with readable authentics and it is possible to date 18 of them in the 10th and 11th c. It is obvious that 3 different methods of wrapping the relics were used. Most probably 3 persons were occupied in the production of the packages. In Gandersheim many Saints were worshipped: Christ, John the Baptist, S. Peter, S. Stefanus, 9 Martyrs and also the bishop Adalbert of Prag who died a martyr's death in 997. Female saints are: the virgin Mary and Saints like Regula, Margareta and Juliana. The church of Gandersheim was consecrated in 1007. This inauguration most probably was a reason to receive further relics. 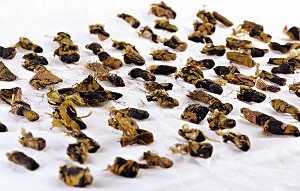 Particles of relics were laid down at the altars which were consecrated. In ottonian times the presence of the emperor in such occasions was important. It was an opportunity to consolidate the political network between the church and the secular elits. The exchance of presents caused durabel political and social commitments. Emperors were obliged to make, to receive and to return presents. One chapter of the book deals with the importance of Saints and relics in the liturgy of the Abbey church. Since Carolingian times relics of saints used to be deposited in altars. It is supposed that in the middle of 15th c. most of the relics were deposited in the high altar. There is a document preserved who mentions 4 keys which had to be kept by different people. Most probably they were part of a medieval lock and key system with several locks and it belonged to a shrine on the high altar itself. After Reformation the relics were translated in the western part of the building. In July 1543 during iconoclasm 16 altars were destroyed in Gandersheim. Some of them were reconstructed shortley afterwards and consecrated in 1550. 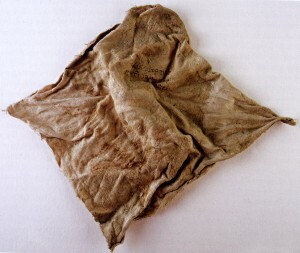 Obviously some of the relics were put back, maybe wrapped newly and provided with new labels. There were also altars in the "paradise hall", which served as a main burial place. This hall was pulled down in 1838. Besides of a deposition in altars there were also shrines and mobile vessels with relics. It is also known that the bones of the Pope Innocenz and Anastasius were translated to the place where archives are kept, and finally buried in 1958 in the church of the Abbey. 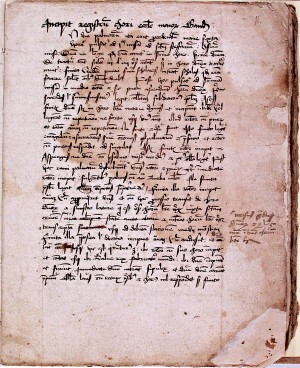 The use of relics before Reformation is handed down to us in the manuscript Registrum Chori. Its directions point to altars which were part of the liturgy on sundays and on important church festivals.